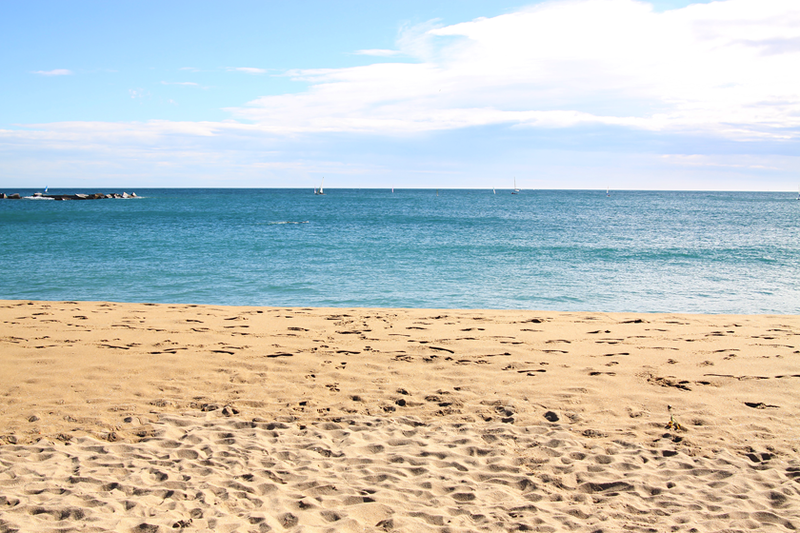 A couple of weeks ago I went to Barcelona for a short vacation trip. 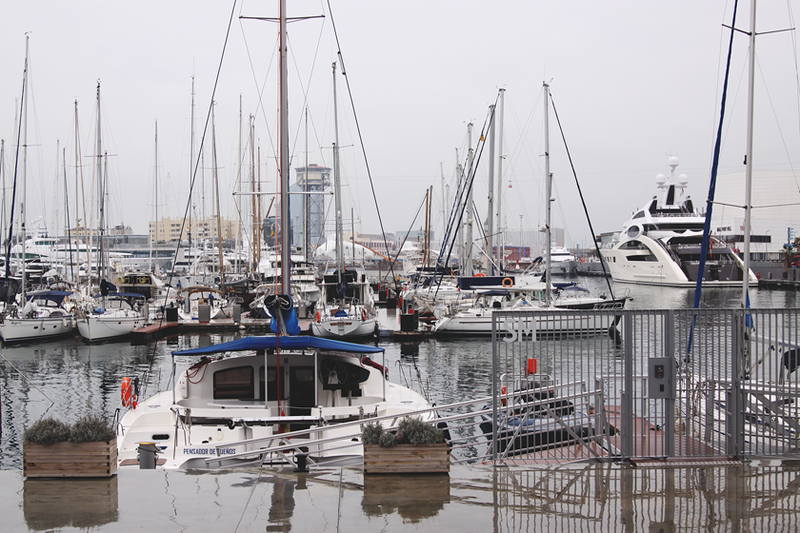 As always I didn’t prepare much beforehand – but came back with some knowledge and nice pictures to share. Here is a small guide of what to put into a tree-day trip to make it an amazing and relaxed time. 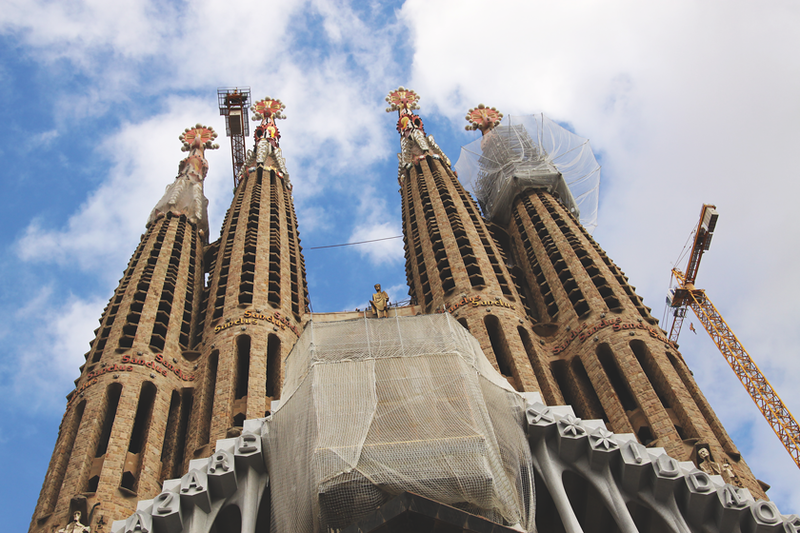 One of the must-sees of Barcelona is this church by Antoni Gaudí which is a truly unique piece of architecture. It doesn’t look like anything else that I’ve seen before and it is not finished yet, even though the construction started at the end of the 19th century – already enough reasons to visit this building. As you might know from this blog already I am not only impressed by the sights themselves but also how they fit into the environment and who they are occupied by. 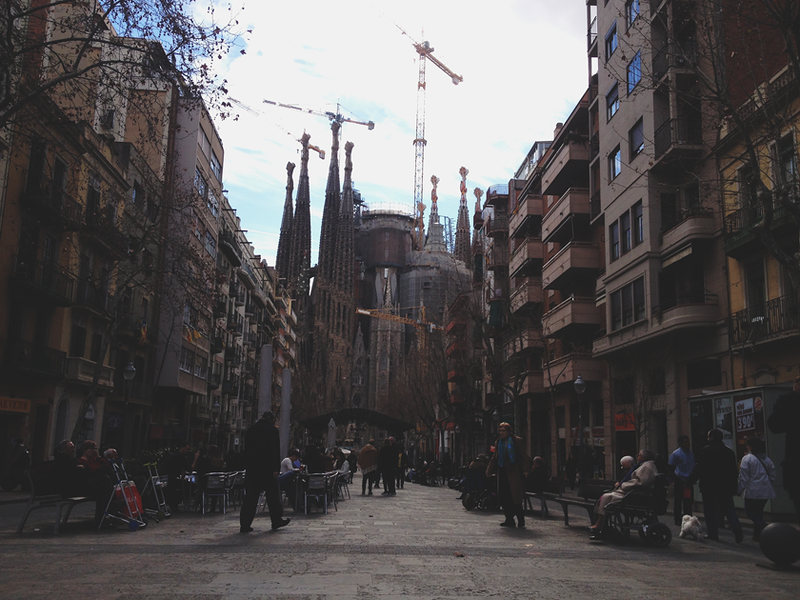 Look how weird Sagrada Familia fits into the other houses around – like a space ship that just randomly landed on a square. There was also an incredible amount of people waiting in the line to get in and others who were taking pictures of themselves and the building. We didn’t go inside as three days is not such a long time – even though Sagrada Familia is also outstanding and beautiful from the inside (I’ve seen videos of it). 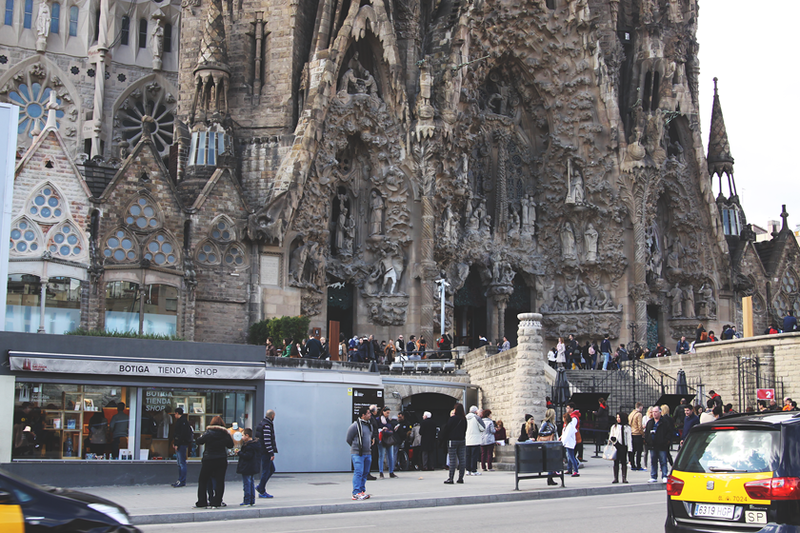 This famous street is impossible to miss as it is one of the two biggest streets of the city and includes two famous building by Gaudí. Casa Batlló you can see above and Casa Milà you can see underneath. 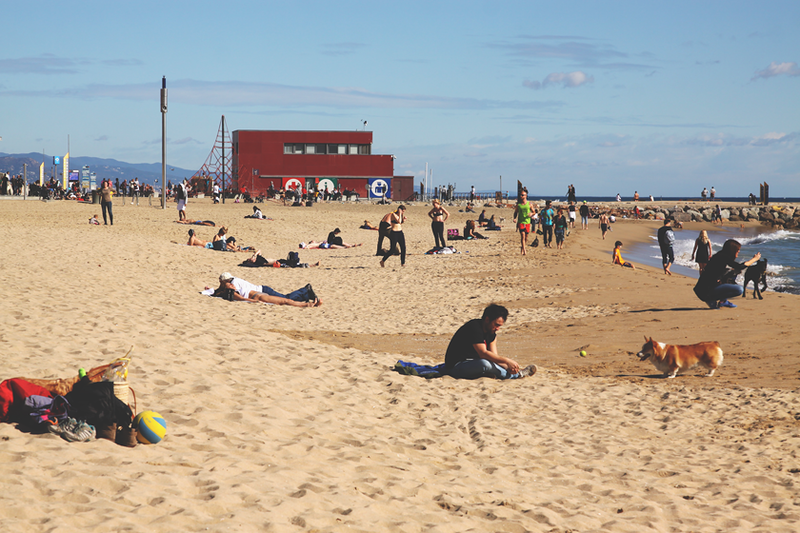 I think they can be visited from inside – which is surely great, if you have more time in Barcelona. 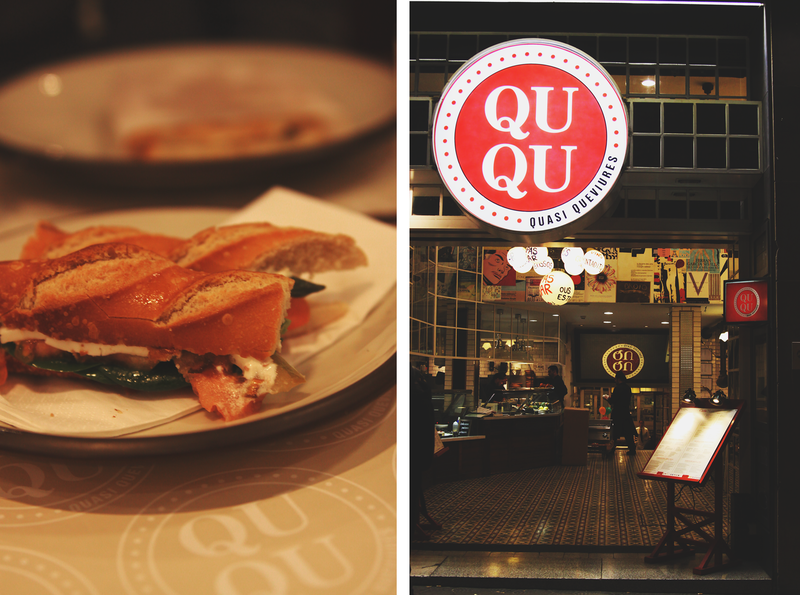 This place QuQu saved our lives when we arrived at around midnight – hungry, lost, tired from the trip. I loved the sandwiches! Only that food choices are quite limited if you are a vegetarian. 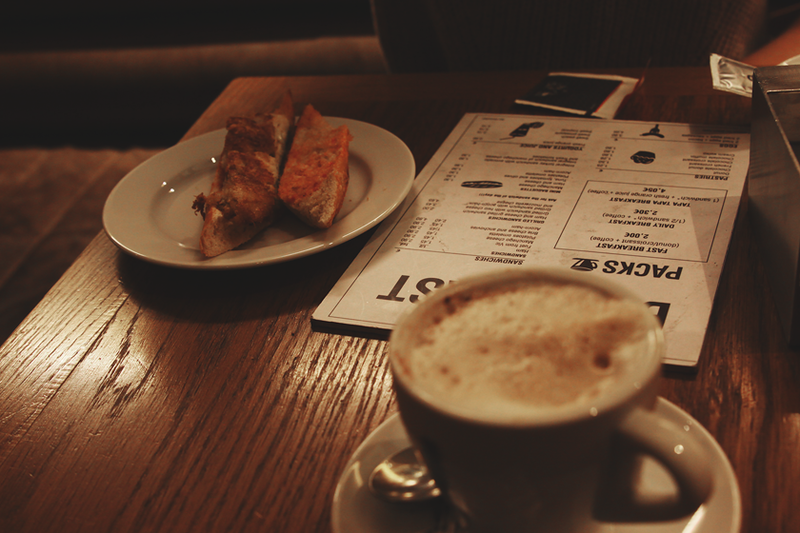 Tapa Tapa is another nice place at Passeig de Gracia I can recommend you. 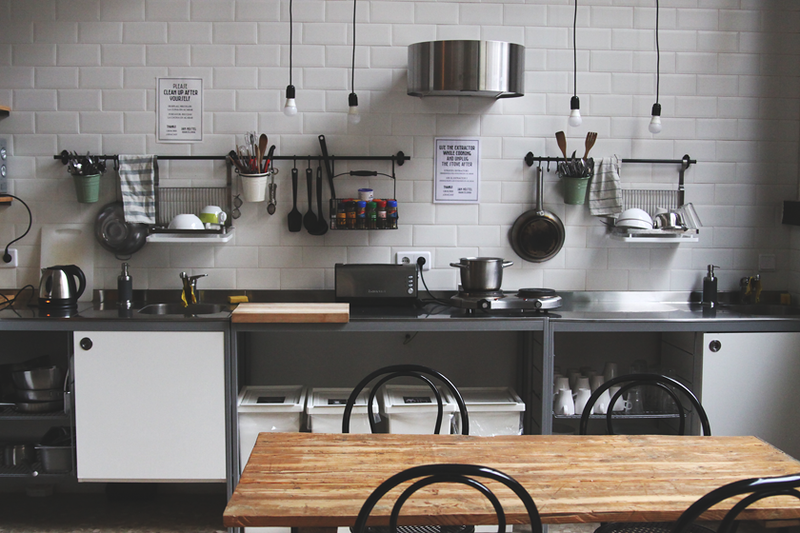 It offers coffee, sandwiches, cake and also lunch & dinner foods. The arch and the park were quite nice to walk through and I am sure, on a nice sunny day, you would love to spend quite some time walking and relaxing here. 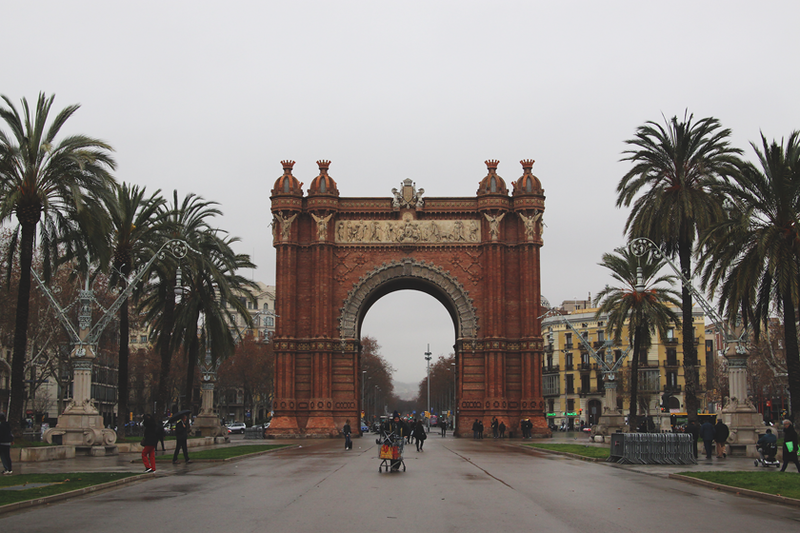 The arch was built as an entrance to the world fair in 1888. 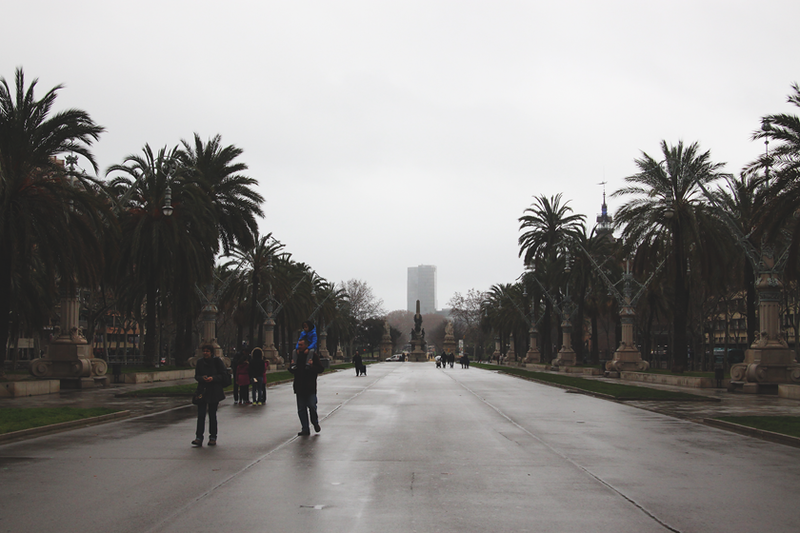 The park includes the Parliament of Catalonia, a nice fountain, a zoo and quite some area to wander around. 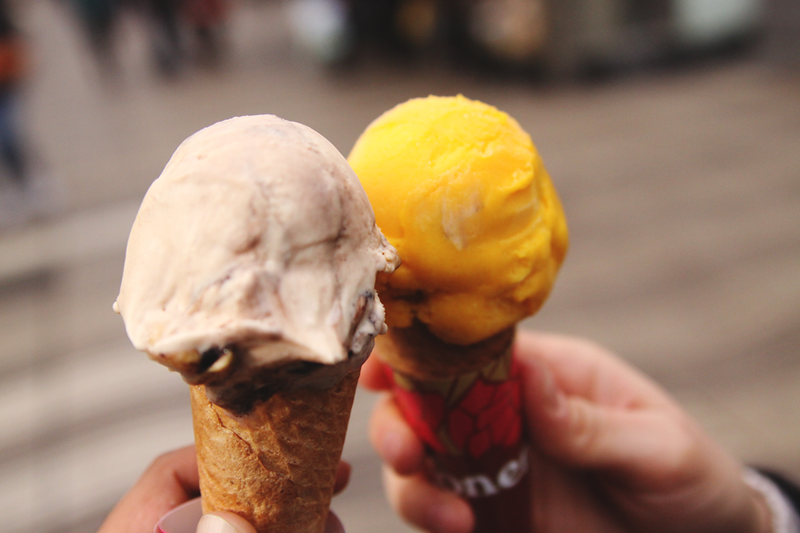 This long street Rambles is very famous and full of tourists – so the only thing I can show you are the ice creams (delicious, by the way!). 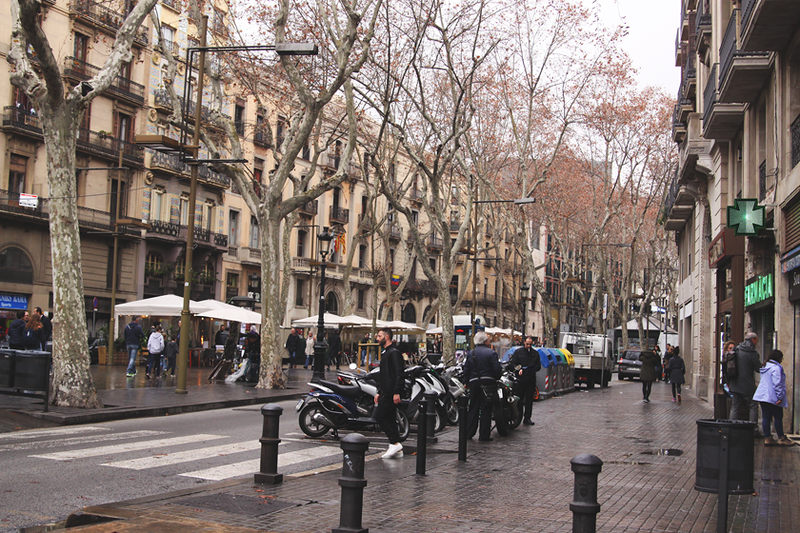 The street starts next to the sea and goes until Placa de la Catalunya where it meets with Passeig de Gracia. 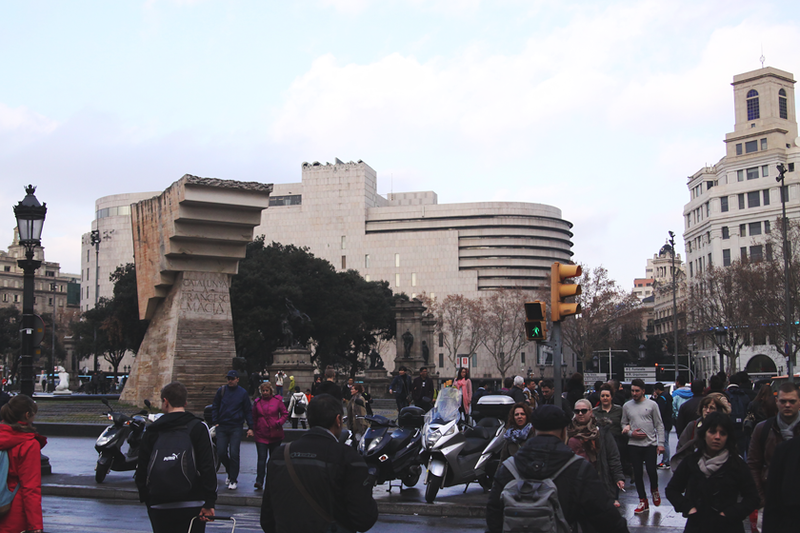 Placa de la Catalunya was super crowded as well – with people and pigeons. What I loved though were the small narrow side streets of Rambles, each of them are worth a visit, where you get lost and somehow always find back to it. Not much is to tell about the beach: Make sure to search the right spot, so you don’t end up watching boats all the time (which some people clearly enjoy!). 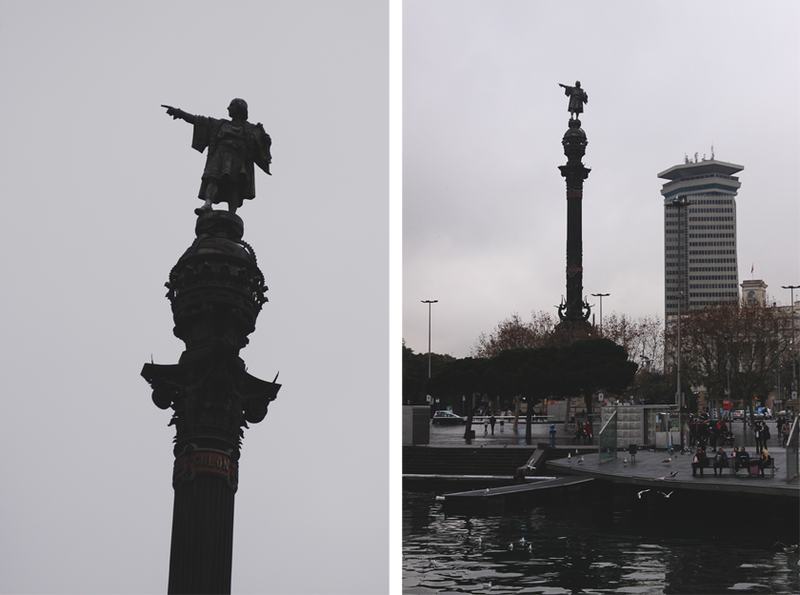 The statue you see above is showing Columbus who is pointing in the direction of the New World. Just found out at home already, as the free city map didn’t explain us who we have in front of us. It was such a nice time sitting next to the water. There weren’t many people, but each of them had on average one dog and one ball with – the ball for the dog or a beach volleyball. I could have stayed here forever, but we needed to catch the flight back. 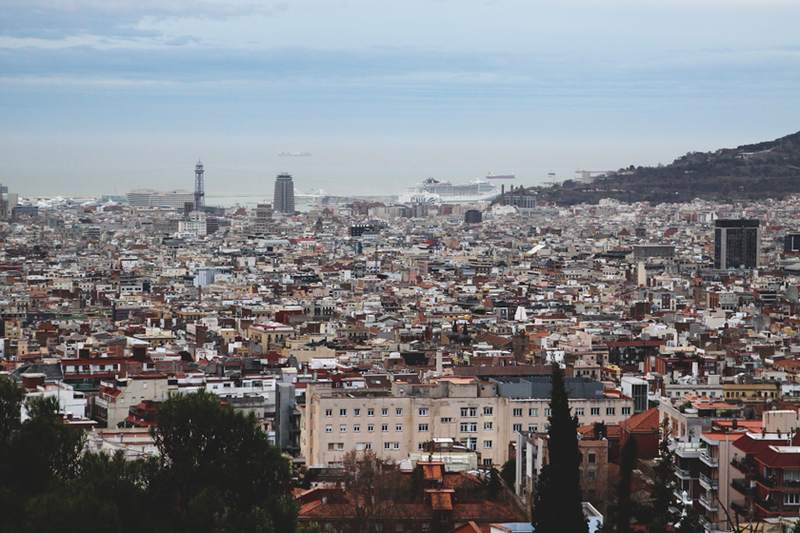 Park Güell is very famous for the stunning view of Barcelona and Gaudi’s masterpieces. In case you want to see the paid part of the park, make sure to come before 17:30 – a lesson I learned from my own mistake! 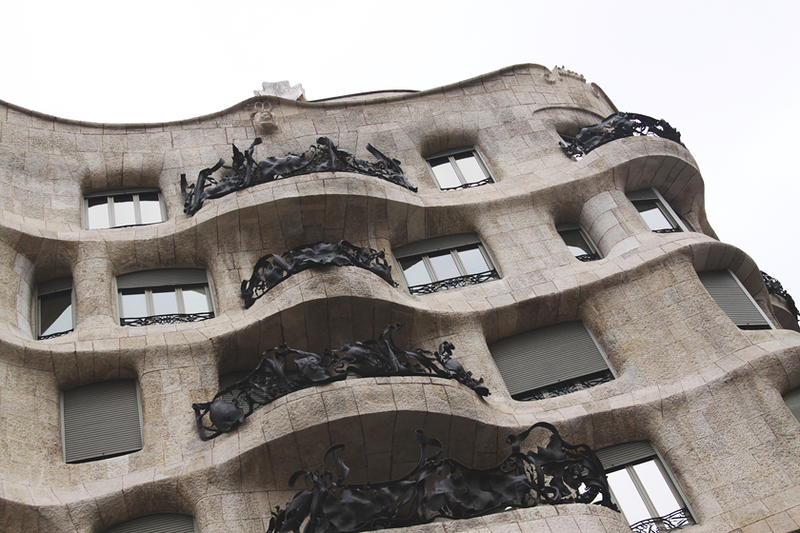 But even without access to Gaudi’s works, it was incredible. This view, the musician we’ve met upstairs, the feeling of walking up made me instantly happy. 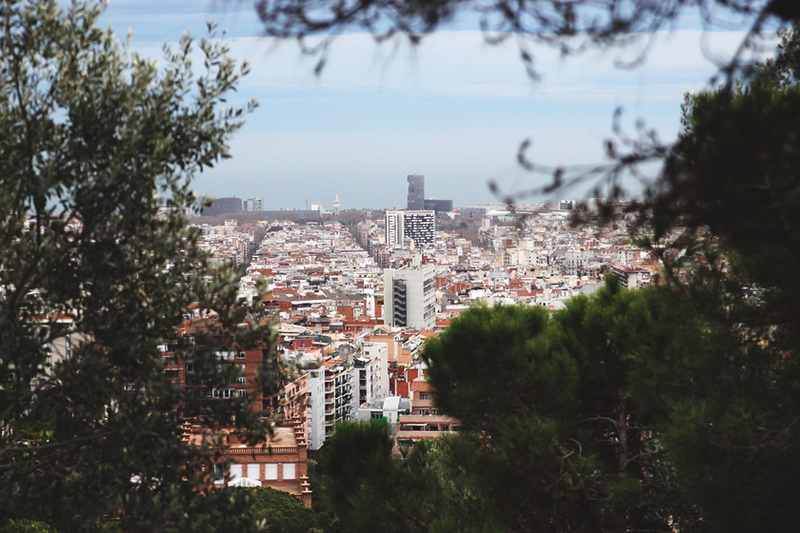 Also that we didn’t pay milliards to get there, as it might have been with Montjuic. 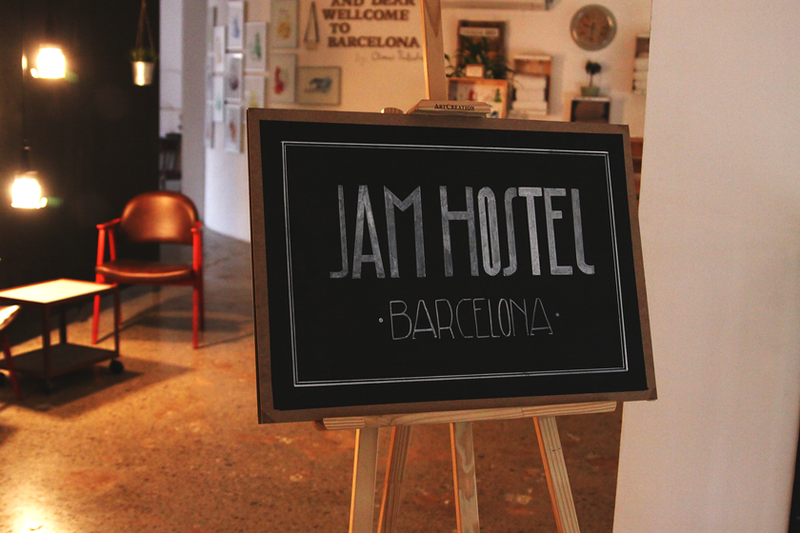 In case you are looking for a neat small hostel which is not located in the touristy areas of Barcelona – Jam Hostel is the perfect match for you. I just loved the district Gracia, full of cute small streets with trees I had to take a pictures of every time we were passing. 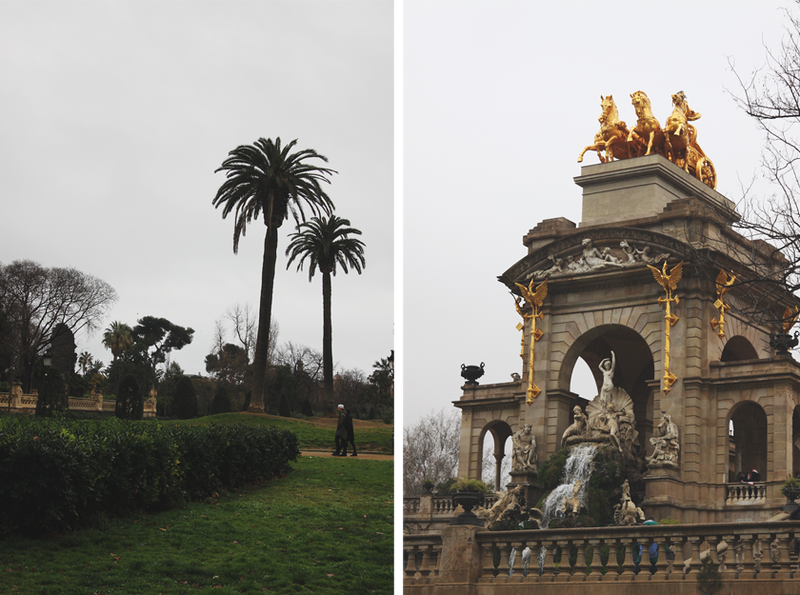 How to get there: 10-minute walk from Passeig de Gracia or 5 minutes from the L4 line’s station Joanic. 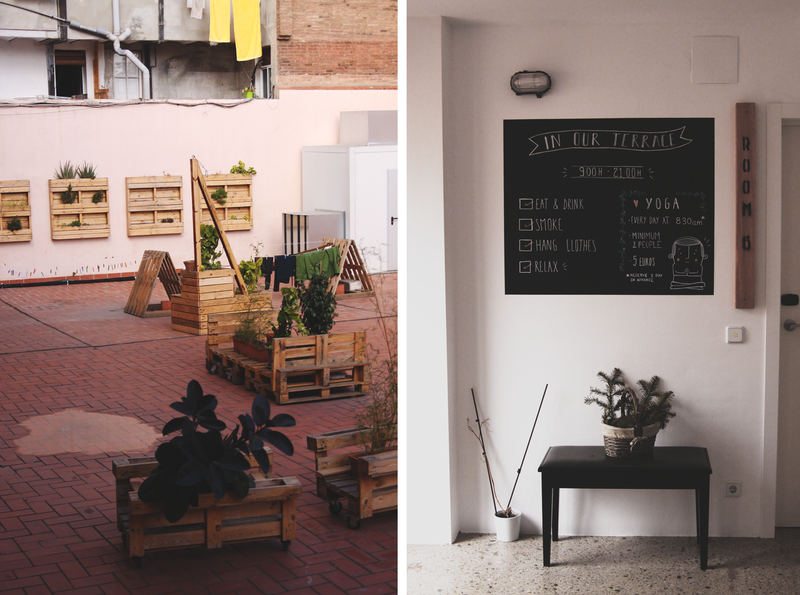 Things I enjoyed here: Free tea and wi-fi, free lockers (work with the room card), the fully equipped kitchen and, of course, the amazing location in Gracia. Things you have to consider: Bathrooms are not in the rooms (was not clear beforehand) and not much was happening in the hostel. 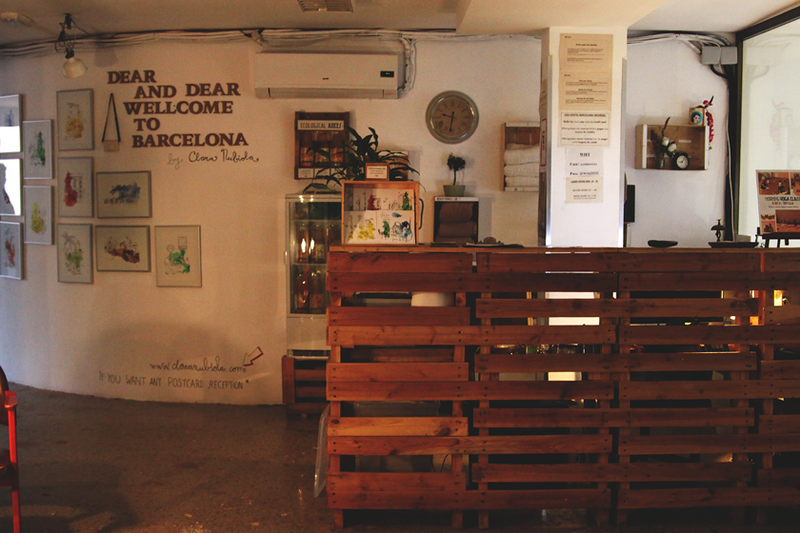 Where I might stay next time: Generator Hostel which is also located in Gracia, but a lot closer to the main street Passeig de Gracia. Video of the amazing atmosphere up there with the sound of a street musician Justin Palat. 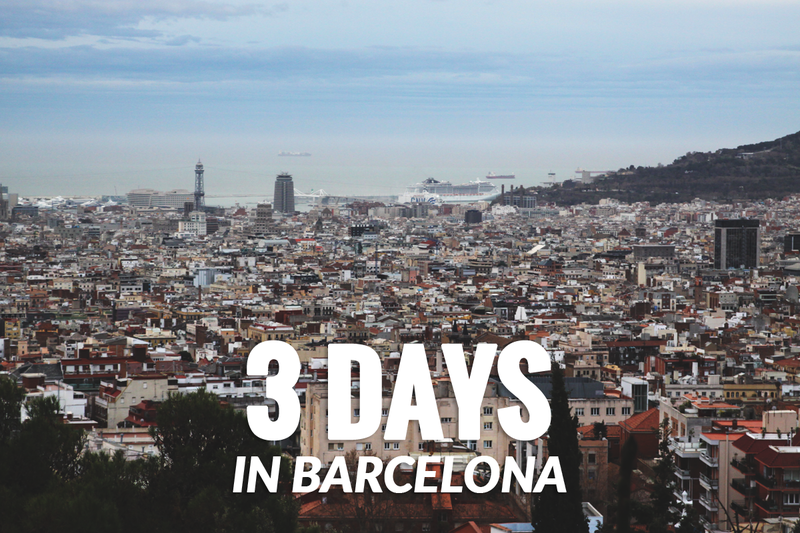 A short impression of Barcelona from above. Why so complicated: This incredible platform is called Ticksa – a micropayment tool where you can offer and see digital content for a price. If you register now, you’ll get some money for free to figure out how it works. And the registration is fast and simple via mail, Facebook or Google+. And here is the musician we’ve seen on top of the mountain, he’s so good! 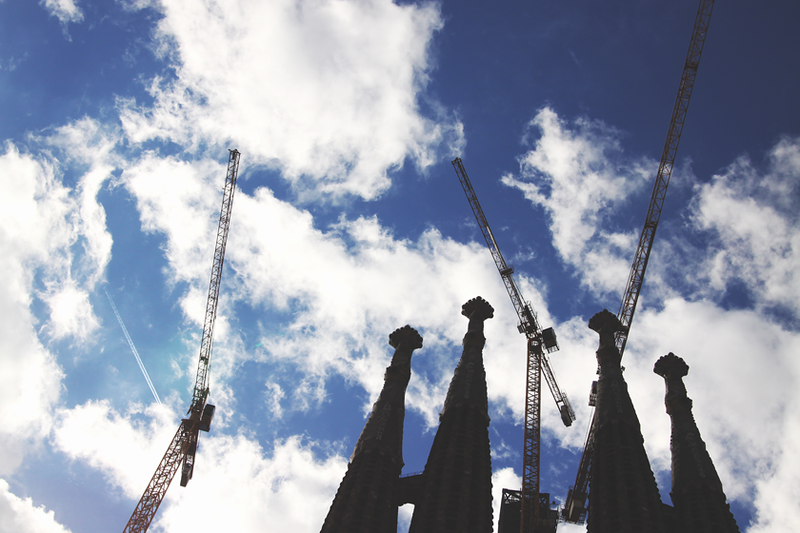 As always I am happy to hear about your trips and impressions of Barcelona – and how you liked my small guide. Is there something you missed? Glad to hear from you.